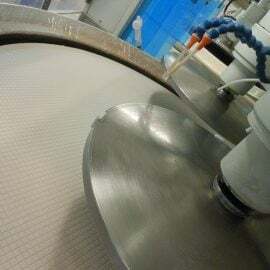 Utilising Optim Wafer Services’ unrivalled wafer polishing skills, we are able to polish most materials. Removal Rates – Low or High removal rates as required. Low Surface Roughness – Typical Ra’s of <1nm. Volumes – Large or Small we can manage either. Typical requests for this type of service require high precision in terms of the control of the material to be removed. Some requests require us to CMP only 1-2um of material, which is usually Silicon, SiGe or SOI wafers. Ra reduction for TSV applications. Post-thinning of substrates that are required to be a nonstandard thickness. To open Poly filled TSV’s but leave a clean, mirror polished surface. Post-thinning of an SOI wafer or Bonded pair of wafers. Typically we are able to achieve low Ra’s, Low Metallics and Defects.